How to Discharge a Monitor. 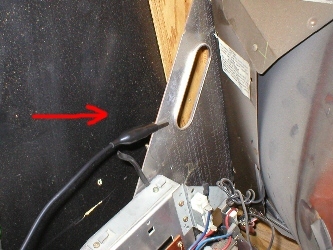 How to Discharge an Arcade Monitor. Roughly 15 to 20 minutes, which includes removing the chasis.
! All notes here are for reference only, i will not be held responsible for any mistakes / injury's done to you, your wife, mates, etc ! 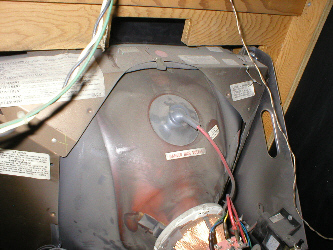 Monitors are probably the most Dangerous thing in an Aracde Cabinet, as they can hold voltages of up to 30,000 volts !!!! Pictures used are of various monitors, some Hantarex some Wells Gardener even a Vector one. you need to have the right tools and even though it is possible to make a discharge probe from a screwdriver, a crocodile clip, a few resistors and a bit of wire, its safest to have the right bit of kit and invest in a HV (High Voltage) Probe. These are available on ebay and prices vary depending on source. To use it you will need a Digital Multimeter, but NOT the Auto -ranging type. The HV probe steps the voltage down by 1,000 to 1, thus making it safe for your multimeter to measure the voltage. 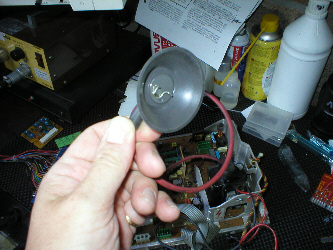 So if there is 5,000 volts in your CRT (Cathode Ray Tube) it will show as 5 volts DC on your multimeter. Before you do anything, UNPLUG YOUR CAB ! Through the whole of this proceedure safety is the most important thing on the agenda. Don't cut corners or make assumptions, monitors have "Danger & Risk of Electrical Shock" labels on the back of them for a reason. They can hold voltages in tens of thousands and are killers. If you are willing to learn how to repair your own monitor, great, its nice to know you are willing to try but PLEASE make sure you use the correct equipment, and most importantly follow the correct procedures with respect to safety. (if you were to get a shock, it will cross your heart !!). 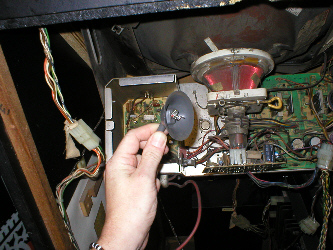 Be very, very carefull when removing a monitor or moving it about, as the CRT (Cathode Ray Tube) is a bit like a bomb, if you mishandle it or drop it, it will implode first before it chucks fragments of razor sharp glass upto 30 feet. If in doubt, DO NOT TOUCH its a brilliant motto, use it. So what exactly do i discharge ? 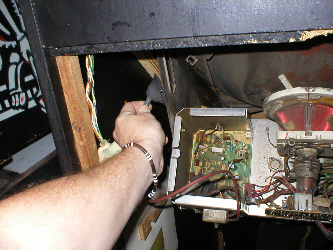 To be able to work on your monitor chasis, you need to remove it and to be able to remove it you need to discharge the CRT. 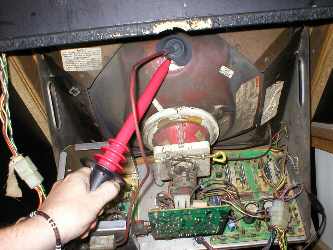 The chasis has a Line Output Transformer (LOPT) on it, which connects to the CRT via a thick red lead and is attatched under a big rubber cup called the Anode cap. This is where the Anode clips into the back of the tube and its here where we discharge the tube. DO NOT grab, touch or fiddle with anything in this area untill the monitor is discharged ! HV Probe meter connections & GND clip. 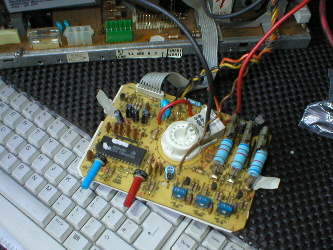 Connect the black lead to the common connector on your multimeter and the red lead to volts connector. Once you have done this select 200 volts DC on the dial in the middle of your multimeter. Now take the black lead with the crocodile clip on it and attatch it to part of the monitor cage, where it will make a good GND connection. Now pick up the probe with one hand and put the other hand you are not using in your pocket, by doing this, you avoid your body making a circuit, in case your other hand is touching something it should'nt. 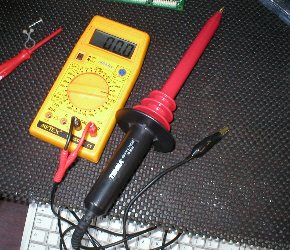 Now gently push the tip of the probe under the rubber cup untill it reaches the clip in the center, if you glance at your multimeter whilst you are doing this any voltage stored in the tube, will be shown on the read out, but only for a few seconds or so.
! Remember the probe steps down the voltage to the meter by 1,000 > 1 ! So if its saying 1 on your display, don't be fooled into thinking its 1 volt DC as it is actually reading 1,000 volts DC !! To be sure that it has totaly discharged, you may want to do this 2 or maybe 3 times, with a few minutes gap in between, as sometimes a tube will recharge a little. Under the rubber cup, is a clip which has a couple of little prongs that face away from each other and these are what clip it in the hole. 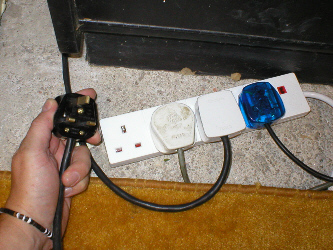 Whilst still keeping one hand in your pocket, grab the rubber cap with your other hand in the center and pinch it together tightly, then whilst still pinched push it either to the left or right of its origional position and then pull towards you, it should then come free from the hole. 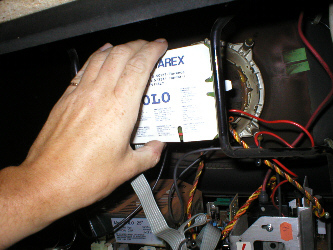 To make sure the anode is holding no charge, touch it agianst the monitor cage a couple of times. Pic on right gives a better view of the prongs inside the cup. As the neck of a tube is easily damaged, it pays to be cautious when removing the neck card, it is also possible to get a shock from the neck pins, so again caution should be used. Grab the card (pcb) at the top and bottom, by the tips of your fingers, very gently wiggle from top to bottom in small increments as you pull, do not rush, take your time and pull gently !